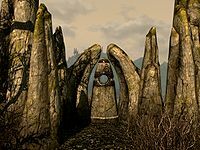 The Lover Stone is one of the thirteen Standing Stones scattered across Skyrim. 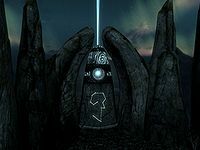 It is situated to the east of Markarth, and just north of Kolskeggr Mine. Approach from the west, as the east side is a cliff. It makes all skills improve 15% faster. If you have The Lover Stone active, you cannot gain resting bonuses in the original version of the game. This makes it a useful choice for users with lycanthropy, since werewolves cannot gain any benefit from sleeping to begin with. There is a leveled animal nearby that you will encounter as you approach the stone and several juniper trees in the area. It overlooks the road that passes Kolskeggr Mine on the edge of a cliff face next to a stream that tumbles as a waterfall to join the Karth River below. Either side of the stone are several upright stones in a semi-circle. The Aetherial Crown(DG) makes it possible to obtain both resting bonuses and the benefits of The Lover Stone. This page was last modified on 19 November 2018, at 04:21.